2018 Realtor of the Year Holly Weatherwax, center, is flanked by (from left) Krissy Jenkins, Laurie MacNaughton, Atlantic Coast Mortgage, 2019 DAAR President Phyllis Stakem and Kaylie Weatherwax. The Dulles Area Association of Realtors recognized several of the industry’s top performers during its annual awards reception March 8 at the 1757 Golf Club in Ashburn. Holly Weatherwax, of Momentum Realty, was named DAAR Realtor of the Year. A DAAR member of 16 years, Weatherwax served as the association’s president in 2018. The Jeanette Newton Community Leadership Award was presented to Gwen Pangle with Pangle and Associates. The award recognizes industry leaders who have made an extraordinary commitment to improving the quality of life in their communities through their volunteer work. Pangle was recognized for her 20 years of working to advance public policies that build strong communities, protect property interests, and promote a vibrant business environment. The growth of Leesburg’s First Friday event was cited as one example of her impact. As part of the award, a $500 donation will be made to Mobile Hope of Loudoun in Pangle’s name. A Special Recognition Award was given to Lars Henriksen, of Century 21 Redwood Realty, for his dedication to advocacy on behalf of the real estate industry and the future of Loudoun County. In 2016, Henriksen was appointed as the DAAR representative on the Envision Loudoun Stakeholders Committee and helped develop the first draft of the Loudoun 2040 comprehensive plan. 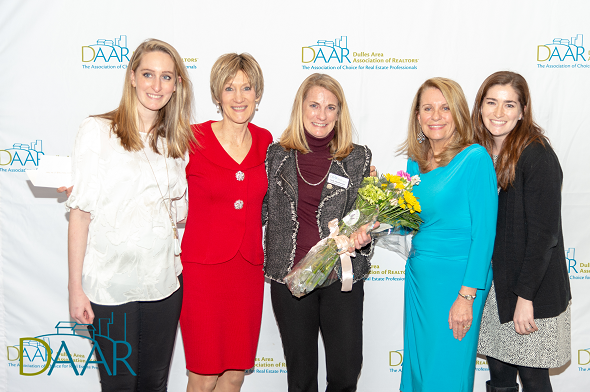 DAAR also inducted new members into its Circle of Excellence, which recognizes Realtors who achieve the highest level of professionalism in terms of community service, education and industry involvement, and business accomplishments. This year’s inductess were Bob Butcher, BHHS/PenFed Realty; Dyana Clarke, BHHS/PenFed Realty; Edna Cross, BHHS/PenFed Realty; Kelly Gaitten, BHHS/PenFed Realty; Tania Gonda, Weichert, Realtors; Gene Mock, Keller Williams Realty-Leesburg; Sue Puleo, BHHS/PenFed Realty; Phyllis Stakem, RE/MAX Select Properties; Ned Stock, BHHS/PenFed Realty; and Holly Weatherwax, Momentum Realty. Top Producer of the Year: Charles Witt, of NOVA Home Hunters Realty. Top Producer Team of the Year:Jean Garrell and the Garrell Group, Keller Williams Realty, Leesburg—Jean Garrell, Mark Garrell, Debbie Buckley, Ronda Hardison, Lisa Krnich, Ruth-Anne Hrebenach, and Marie Curtis. Rookie of the Year: Matt Boyer, Keller Williams-Loudoun Gateway. Affiliate of the Year:John Slye, Fidelity Bank Mortgage. Educator of the Year: Aimee Waltz, Fidelity Bank Mortgage. Among those marking membership anniversaries with the association was Edna Cross of BHHS/PenFed Realty, who reached the 50-year milestome.